During my visit to Windsor Castle last week I spied these three. I loved that the dog’s harness matches their shoes. And the dog is adorable! I hope to share more photos from my visit soon. This entry was posted in Travel Photos and tagged 50 Year Project, Berkshire, Blog, Blogging, Castles, England, English History, English Landmarks, Life, Photography, Travel, Travel Blog, Travel Journal, Travel Photo, Windsor, Windsor Castle. Bookmark the permalink. It’s a wire-haired dachshund! my aunt used to breed them. Great little dogs. I bet they are cute puppies. Oh they are! I have some slides, but no photos that I can think of. It has been years since I’ve seen a slide show. I agree – the pooch is cute! Aren’t they sweet? I’d love to have tea with them. I bet you would hear some good stories. 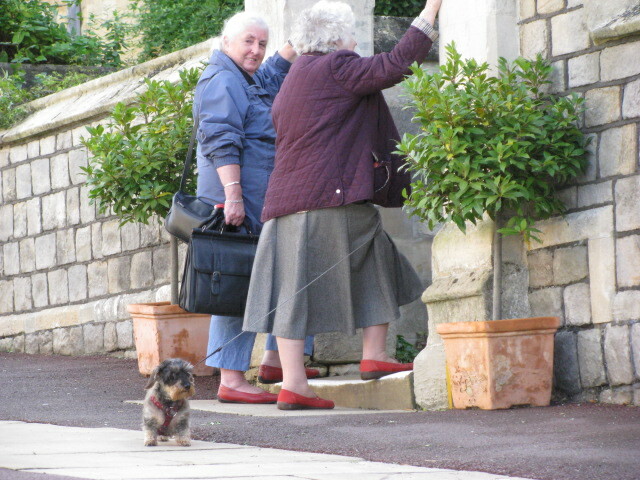 so sweet, well spotted … i was taking surreptitious photos of dogs and owners in my travels too … always so charming! I try to snap photos without getting caught. I wasn’t successful this time, but the woman gave me a friendly wave. So cute! Good you saw the sameness in shoes and harness! I hardly ever match with Miles. Maybe I need new shoes. Maybe . A change is as good as a holiday! Oh, that dog just begs to be snuggled! So cute. I bet he has a devilish side when he wants to get his way. Little dogs are so cute. That’s sweet! I like the matching red shoes.